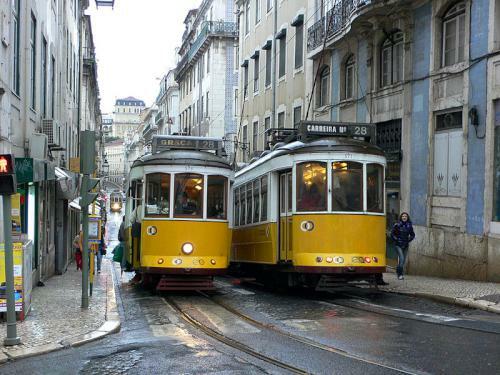 The transport system in Lisbon is excellent, with buses, metro, trams, taxis and funiculars interlinking from the centre to the far corners of the city, but it is the trams that really stand out. 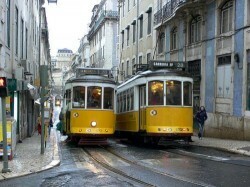 Lisbon’s vintage tram network is as much a part of the ancient city’s cultural fabric as the buildings, monuments and attractions that so many visitors flock to discover every year. The trams operate as a hop-on, hop-off service, much like a bus but with fewer problems in finding their way through the busy city centre streets. 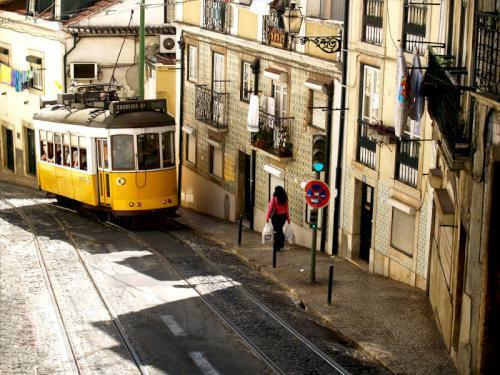 Discovering Lisbon by tram is one of the highlights of your visit to Portugal’s capital, and tram 28 has to be the pick of the crop. Tram 28 is a vintage yellow tram that criss-crosses the city centre, through wide esplanades and narrow streets, taking in many of Lisbon’s most important sites along the way. In fact taking a trip on tram 28 has all the benefits of a rooftop sightseeing bus tour without the questionable commentary, and with the added bonus that you can start, finish and stop off just exactly when you like. It is also significantly cheaper than taking an organised city centre tour. 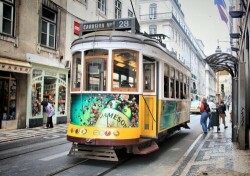 The trams are known as ‘electricos’ in Portuguese, so look out for ‘electrico 28’ and you’ll be in business. Tram tickets are available from kiosks located throughout the city, as well as in the metro stations. A 24-hour ticket is well worth the money, enabling you to jump on and off the tram to your heart’s content. Tickets are not limited to a particular tram line either – they are valid for all trams, buses and metro lines for a 24-hour period. There are all kinds of places to visit on the tram 28 route. Head for Graca, the old area of the city, which is being beautifully restored, returning the old tiled buildings and mansions to their former glory. The Largo da Graca has a charming garden with plenty of shade in which to relax to the sound of the local church bells. 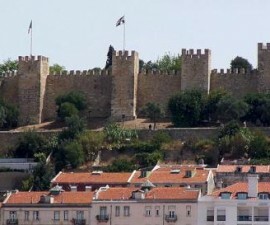 Next stop on the tram 28 route is St George’s Castle, the ancient fortification which sits at Lisbon’s highest point, perched right on top of a hill overlooking the Alfama and the river Tagus. Much of the castle was destroyed by the devastating earthquake of 1755 but it is still well worth a visit to admire the ancient walls and towers, some of which date back as far as the 6th century. 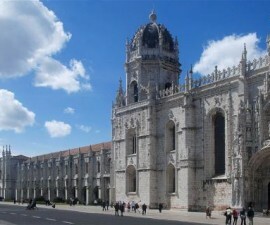 It is also the former residence of Portugal’s royal family, and the remains of the palace can still be seen today. The best stop for St George’s Castle is at the Portas do Sol viewpoint, which affords delightful views down to the river Tagus, with its boats docked in the harbour and the Alfama rooftops dropping away below. Carry on to the Chiado to explore Lisbon’s arts quarter. 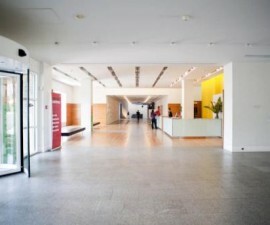 Located adjacent to the nightlife spot of the Bairro Alto, the Chiado is a little more sophisticated, with many theatres, cafés and boutiques to explore. Finish your trip at the Campo de Ourique market. An indoor and outdoor market that has enjoyed a major renaissance in recent years, the Campo de Ourique is the perfect spot to load up on your Portugal travel mementos.